We have continued exploring the sport-climbing crags around Canmore; we’ve revisited Grassi Lakes (a couple of times), and checked out Bataan, Cougar Canyon, and The Back of the Lake at Lake Louise. 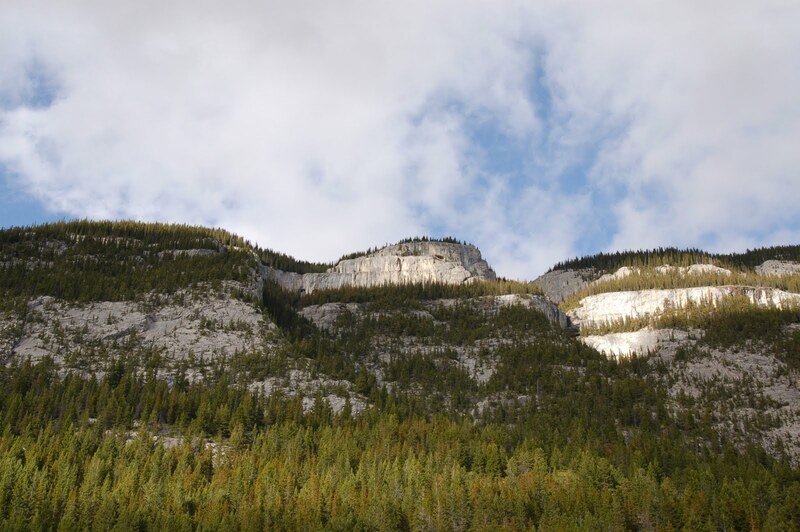 We hiked up the steep hour-long approach to Bataan with high expectations—our guidebook calls it “the finest sport crag in Canada”. Most of the climbs here are in the 5.11 to 5.12 range, but we decided to start on a wall called “Sweet Hereafter” that has some 5.10’s to warm up on. 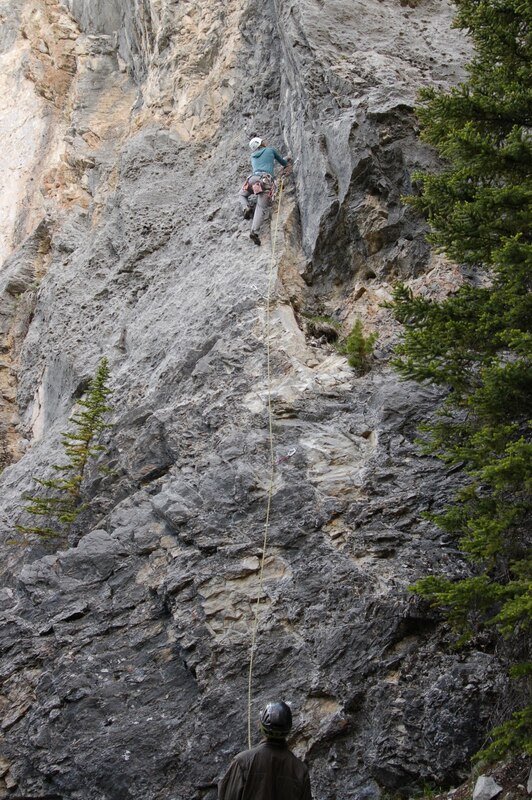 After watching Matt I lead “Jaws” (10b), I pulled the rope to lead it myself. Halfway up the route—at about ten meters—I started thinking about how how terrible it might be to take a fall. And then I started to notice, or at least imagine, that some of the rocks felt a bit loose. I started to freeze up as I felt my nerves take over. I slowly and ungracefully finished the route, thinking through every move and the commitment that I was willing to take on it. Once back on the ground, Matt II asked me what had happened. I shrugged and told him I didn’t really know. “I think you need to take a fall,” he said. 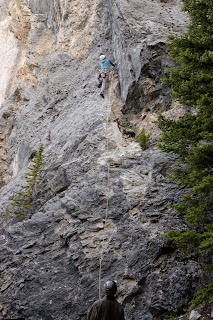 We went to the next wall over and Matt I led “The Candy Man” (11b). Even though I had never attempted to lead a route that hard, once he had lowered down and pulled the rope I knew that it was my turn. I clipped the first three bolts without a problem—I then decided that I was high enough to practice falling. “Okay, I’m going to take a fall!” I shouted down to Matt a little too loudly. I climbed to just above the bolt and then let go. I felt the tug on my harness and then realized how ridiculous I was being—it’s really okay to fall when sport climbing (most of the time). Now I can’t believe I actually hadn’t let myself fall before this. Nick, Matt, and I spent a relaxed afternoon at Cougar Canyon the next day. Nick went fossil hunting up the river while Matt and I climbed—Nick didn’t find any fossils on the ground that day, but I found an old coral halfway up a route. That evening we met up with Gene and then went to Lake Louise the next day. The lake was gorgeous, and we got to climb on quartzite, which felt very different from the limestone of the other crags—it was more polished, with lots of little ledges for hand and footholds rather than the pockets left over from dissolved corals. We got a lot of attention because the climbing was right along a very popular hiking trail around the lake. While I felt a bit like a tourist attraction, and answered many questions about the process of climbing, it was kind of fun to get cheered on by a small crowd while I was at the top of a route. Awesome adventure. Thanks for sharing your experience. Have you tried stand up paddleboarding in Lake Louise. Its a beautiful lake and i know its perfect for that water sport. Let us know if you're looking for Paddleboards in Alberta.